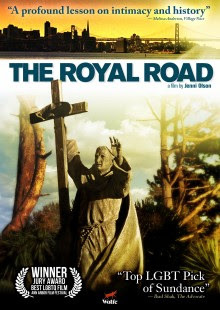 ROYAL ROAD is Jenni Olson's hour long meditation on her life, gender, love, the movies, the Spanish conquest of the American South West and whatever subjects that drift off from there. The film is essentially an illustrated monologue told via voice over as Olson discusses her life or a version of her life, including her appropriation of male characters from films as a means of connecting to the world. The on screen images are of various locations that we are to believe the places we are hearing discussed. As to whether this is true or not is for us to decide, though I'm guessing that they are more spiritually connected places rather than actual ones (at least as far as the cityscapes are concerned. I am a sucker for films like this. I love to have some one tell me a really good and really involving story. My collection of films is littered with similar films where the filmmaker is essentially giving us an illustrated lecture of of some kind- one where the words mix with the images to become something greater. While this film is nominally a documentary, the style is frequently used by fiction filmmakers such as Peter Greenaway in many of his early films (THE FALLS, WALK THROUGH H) or Patrick Kieller's ROBINSON films. What I like about the film is that while it begins with Olson's search for identity in Hollywood portrayals of masculinity the film is in actuality simply about a quest for self regardless of if you are a person or a country. This is about the paths we all take to now even as we look back at the past. You have to forgive me as I fumble my way through this review because this is one of those films that I can tell you what it is, and it is deceptively simple, but at the same time it kicks up a whole hell of a lot of thoughts and feelings and ideas. In trying to explain my feelings about the film I find I want to say everything right at the start-as if every sentence of thought and feeling wants to come out out at once. At the same time I'm trying to wrestle with the fact that if I started to actually write down everything that this film kicked up and where it goes and all of that we'd probably end up with a piece that's novella length. This is the problem with writing on film,or writing on anything thing. There are times when you are required to say something or explain things and it's kind of pointless to do so. It's like the comment the Quay brothers made when I recently spoke with them and they basically said things sometimes just are and it's kind of mad to try and explain them. ROYAL ROAD is something that is going to kick up stuff and affect each viewer differently because it's going kick up stuff from each person's life. How I am reacting, what I am trying to explain is not how you are going to react. I think probably the best thing I can say is that you need to track this film down and just see it. It's an hour so it's not a huge commitment of your time- at least on the front end- on the back end I'm guessing you'll be discussing it and mulling it over for a few hours afterward. If you are in New York Friday or the following week, make your way to Anthology and see the film, If you're not watch the film's website for screening locations and details on how to see it.